CTG can filter the oil in your turbine oil, lube oil or hydraulic oil system to minimise contaminant and help you achieve the best possible ISO 4406 oil cleanliness. CTG’s oil purification filtration service uses specialist equipment and trained technicians to save you the costly equipment downtime, new oil purchases and high labour cost associated with oil change-outs. Furthermore, Oil purification filtration reduces the reliance on costly in-house filtration methods by providing cleaner oil quickly and efficiently. Oil circulates through our specialist equipment without the need to shut down your equipment. Oil purification filtration is effective at removing wear metals, particles, water and unwanted gases to rejuvenate your system. 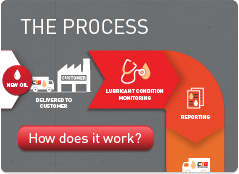 A cleaner lubrication system reduces equipment wear and will increase your equipment reliability. Our flushing systems are equipped with high efficiency pleated Microglass oil filter elements rated Beta(c)1000 per ISO 16889 to quickly and reliably achieve very low particle counts to meet or exceed an ISO 16/14/11 cleanliness level. In the case of high contamination, CTG technicians are trained in confined space entry, which enables them to enter and thoroughly clean your reservoir. When oil gets contaminated, replacing the oil will not clean your system entirely. If the system is not cleaned effectively the new oil becomes contaminated with residual particulates left in the system during the oil drain. The end result is contaminated new oil which will provide little improvement in the functioning of your equipment.